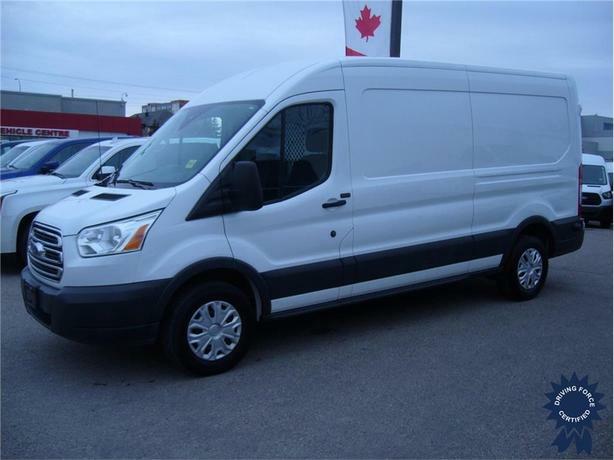 This 2017 Ford Transit T-150 Medium Roof Cargo Van comes with a 148-inch wheelbase, 6-speed automatic transmission with over-drive and SelectShift, 3.73 limited-slip axle ratio, cloth bucket seats, heavy-duty alternator, 16-inch steel wheels, cargo side step, AM/FM stereo with CD player and SYNC, remote keyless entry, power door locks, cruise control with message centre, vinyl sun visors, front and rear vinyl floor covering, limited slip differential, Bluetooth hands-free calling, tilt/telescopic steering, passenger-side sliding door, heavy-duty alternator, tire pressure monitor, smart device integration, three 12V DC power outlets, manual air-conditioning, light tinted glass, cargo lights, clean CarFax vehicle history report, 2 sets of keys, balance of factory Ford warranty, 120 inspection complete, 3,400 lbs Maximum Payload, and GVWR rating of 8,600 lbs (3,909 kgs). The 3.7-litre V6 gas engine provides 275 horsepower at 6,000 RPM and 260 lb-ft of torque at 4,000 RPM. Touch base with us to discuss purchasing or financing options that are right for you and experience the difference you will only find at DRIVING FORCE Vehicle Rentals, Sales and Leasing.